I’m not the most athletic gal in the world (by far! ), but one thing I can do is run. There are no balls or rackets or rules involved; it’s just me and a pair of shoes, putting one foot in front of the other. It sounds easy and fun, right? It’s easy and fun when I begin a run. I have all the energy and motivation in the world to get myself out the door and to hit the pavement. Somewhere near the middle of the course though, my body starts feeling its age. My lungs cry out for more oxygen, and I want to give up because the finish line seems so far away. Toward the end of the run, my legs threaten to quit, and every step I take requires a great amount of mental concentration. When I finally reach the end, I rejoice not only because I’m done, but also because I’m reminded of why I ran in the first place. I feel stronger, and all the hormones coursing through my body make me happy. I realized running and writing have a lot in common. I recently started a new book, the second one in my Spark Brothers series. After a few days of brainstorming and plotting, I had outlined the whole story, and even written the blurb for it. I opened up a new document and dove in, writing the first two chapters in one day. I was so excited about my progress, I couldn’t wait to continue writing the next day and the next. A week into the book though, I began feeling it. “It” being reality. ;) The gears in my mind started to slow down, and I had a hard time getting the words out. The initial spark I had had all but fizzled out. I started thinking this book would never get written (and I’d have a lot of readers upset at me)! Fortunately, I’ve been through this process before, both in the areas of writing and running. I’ve come to expect the dreaded middle of a book. This is where I need to remind myself that I’m in this for the long haul, that I’ve faced and overcome this hurdle before, and I just need to take things one step—even one page, paragraph, or word—at a time. 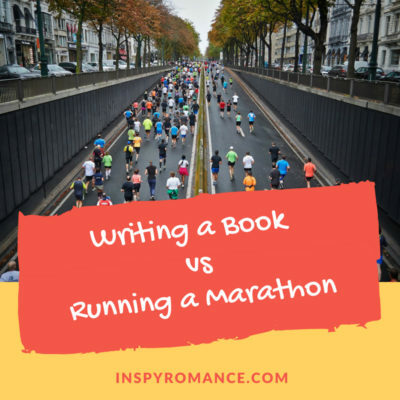 Writing a book is like running a marathon. It requires commitment, patience, and guts. So much guts! ;) But the experience is also exhilarating and worthwhile. What have you done in your life that’s taken the dedication and hard work similar to that of running a marathon? How did you persevere? Please share in the comments below! Giveaway: I’d like to give away one digital copy of a book from my backlist (boxed sets not included). Two winners will be randomly chosen from the comments below. The giveaway will remain open until midnight on Sunday, May 27th. Hi Liwen! I’m a runner too, for similar reasons… although I’m slow from the start. It’s a great comparison. For me, sometimes I have trouble even getting started on a run… and I’m the same way about writing books. Hi Lee! Oh, I can definitely relate! Sometimes I’d rather do anything but run (and write). Each step of the process has its own challenges, doesn’t it? Thanks for commenting! Hi Liwen! Interesting, but fitting analogy. Preparing for most careers, whether doctor, lawyer, teacher, nurse, dental assistant, is like preparing for a marathon. One starts a program with high hopes, but then dedication, commitment, patience, guts and hard work to finish the course work and take the exams. Artists, musicians, bakers, chefs also have to be dedicated when what they see, hear, taste in their minds is not what is produced. Even as readers, we show dedication and commitment to the author when we finish reading her works and then follow up by writing a review and telling others about a work that touches our hearts. Happy Writing. Stay Dry. In SW Michigan experiencing one of the wettest Mays in recorded weather. It is raining again – the fourth day in a row. Hi Renate! That is so true about readers taking the time and commitment to read an author’s work. We couldn’t do it without folks like you though, so thank you! And oh my, I hope you stay warm and dry. Sending you some sunshine from CA! Hi Liwen, I love to run as well- I am not coordinated enough for sports with bats/balls/catching, so running/cycling etc. are my thing. Hi Wemble! I totally agree, raising and teaching kids definitely require a long-term perspective and commitment. Chocolate keeps me going. :) I have to ask, what are chilli chips?? Here in Australia we have a brand of chips called Red Rock Deli-they make yummy chili flavored chips!! Interesting! I bet my hubby would like them. Ah, good morning!I am no runner, but I get the comparison! Thank you for sharing! Hi Paula! I wouldn’t call myself a runner either, just someone who runs (once in a while)! Thanks for reading and commenting! I’m not a runner either, but I have persevered to the end of writing a book. This analogy is right on. It takes just as much determination to finish your writing goals as anything else. I had never finished a story before. I always hit the wall of the messy middle and gave up. For me, it was because I hadn’t planned and didn’t know where I wanted the story to end up. Once I made it my goal to finish the plot and get to “the end,” I pushed through difficulties and finished. Hi Lila! That is wonderful! Congrats on finishing a book. That is no easy feat. I’ve found that plotting before writing helps me, too. Thanks for reading and commenting! I’m not a runner, but your comparison reminds me of homeschooling. Every year starts with fresh anticipation and excitement, but the middle part seems to drag on forever. Hi Melynda! Oh, I bet it does! Hopefully you’re feeling more motivated now that the school year is ending? Thanks for reading and commenting! My husband is a marathon runner and he’s voiced similar frustrations. School/training for my profession was really long and tedious but I had to be reminded each day (and even now when I am working) that this is God’s calling on my life. It doesn’t make the here-and-now easier but at least the vision keeps me going. Hi MH! Wow, kudos to your hubby and to you for your perseverance. Yes, knowing you’re doing what God made you to do is a great motivator. That certainly gets me through the hard times. Thanks for reading and commenting! Before knee surgery I could relate to you exactly. Now it’s writing, or sometimes just doing all the mundane, daily things that need doing on a ranch to keep the plates spinning. Hi Dalyn! Oh wow, I bet there are a ton of things you need to do to keep a ranch going. What a neat experience to have. Do you write about ranching, too? Thanks for reading and commenting! Getting a PhD was definitely like running a marathon. Can’t think of anything else in my life that took as much sweat, no vacation, barely no down time, almost not enough time to breath and take some water… but in the end it leaves me with a good feeling (albeit really really tired). Thank God I’m done with that. Just got a FB warning to tell me that it was exactly 3 years ago this past weekend. I’m a PhD in Developmental Psychology, though most of my research is just basically Cognitive Psychology (which means I basically don’t work with developmental stuff at all and my research intends to understand is human cognition in its pure form / lab, not real life per se). I’m unfortunately not quite working with that (yet!! praying everyday for a new job), but on a second postdoc that gives me time to do my psych research on the side . Wow, you’re a woman after my own heart, except for the amazing PhD part. ;) I love all things Psych, too, but more in a hands-on way (I used to be a therapist before I had kids). I’m so excited for you and all the cool research you must be doing. Will pray for God to provide a job for you! I finally went to college, years after high school so that was tough to have to remember back to high school to write essays and for science etc. Worked really hard though and kept a 4.0 gpa for a couple years which I had never had before. Keeping that became my incentive to keep pushing myself, at least until I got to A&P and nothing I did and no matter how hard I tried was keeping my goal in that class. But I ended up having to drop out for health reasons so I didn’t get to finish sadly. Hi Cassandra! It sounds like you persevered as hard as you could! I’m sure you learned a lot of great lessons through it that can be applied to other areas of your life. I hope your health is doing better now. Thanks so much for reading and commenting! I’m currently transferring my nursing license to a new state with a lot of requirements. I have mini goals for each day to keep me headed in the right direction. Hi Diana! Wow, that is wonderful. I enjoy walking, too (more than running, in fact). Best wishes on transferring your nursing license! Thanks for reading and commenting. Hi Shelia! (Nice to bump into you again!) Yes, that is the ultimate analogy for running. Thanks for reading and commenting! Great post, Liwen. I’m not a runner, but I’ve definitely written the lung screaming marathon book. Sometimes, they come easy and flow from the fingertips. Sometimes not. Hi Shannon! Yup, totally get what you mean! Just gotta keep at it, one word at a time. :P Thanks for commenting! I used to be an athlete before chronic illness took over my body and one thing I liked about running was the finish line always in sight in my mind and that helped me persevere to just keep putting one foot in front of the other until I was done with the run & had met the goal. (By the way I always preferred running with an objective in mind–like running after a soccer ball or a Frisbee!) Now it is that same athletic mental perseverance that helps me make it through my days battling the chronic illness. Take it one moment at a time, one day at a time, one week at a time, one month etc. Then you make it through and a feel better day will come before you know it and the waiting will be worth it. Sure it goes in cycles, but doesn’t everything in life go in cycles? I hope you find that mental perseverance and are encouraged from all these comments to keep at it. The reward at the end will be worth it! Hi Candi! Oh my, your words just lifted my spirits so much. Thank you for sharing your experience. I am so encouraged and inspired by your positive attitude. Big hugs to you! I pray you have a feel better day soon and more often. Thanks for reading and commenting!